Geneva is an idyllic city. On the edge of Lake Geneva it is littered with parks, promenades and wonderful mountain views. Compact and well organised the city is ideal for a short school trip packed with educational value. Scientists will marvel at CERN, the world's leading particle physics lab. 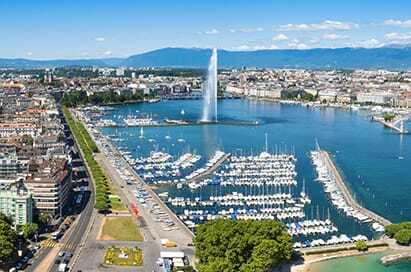 Also known as the “city of peace”, Geneva has a prominent place in world events thanks to its central and versatile location; more than 20 international organisations have their headquarters here including the UN and the Red Cross. 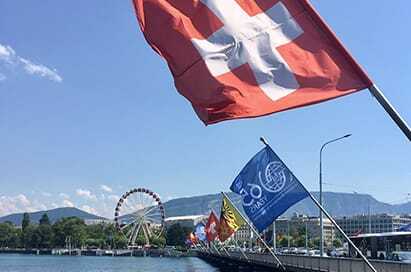 Boat trips on the lake, cable car rides in the mountains and fondue establish the Swiss connection that will leave your students enthralled with this cosmopolitan and stunning city. A great way to sightsee is on board a cruise on one of Europa’s most beautiful lakes allowing you to discover the major attractions of Lake Geneva : the stone of Niton, the Water Fountain, the Black Harbour, the Diodati house, The UN building, the castle of Bellerive, the Mermaid, and many more interesting sites. Originally a simple security valve at the Coulouvrenière hydraulic factory, the massive Jet d'Eau fountain has grown to become symbolic of Geneva. In the summer months, eight 13,500-watt projectors light the fountain's majestic column in the evening, as it soars into the sky. The Cathedrale Saint-Pierre is one of Geneva's main attractions. It has no less than 157 steps which lead to the summit of the cathedral’s north tower, and to a fabulous panorama overlooking the city and the lake. You will also be charmed by the Clémence, the queen of the bells, weighing over 6 tons and hoisted to this very tower in 1407. It is impossible to describe Geneva without making reference to the world-renowned Geneva watch industry, which is a real symbol of this city. 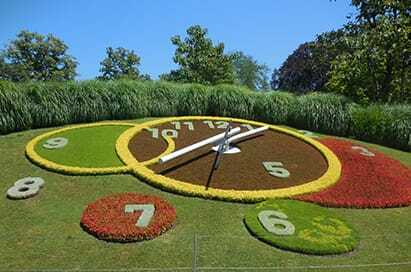 The famous flower clock represents this perfectly as it is a true masterpiece of technology and floral art. Built in 1955, it is located at the edge of the Jardin Anglais and offers a delightful sight. Just across the French border is a cable car that carries you to an altitude of 1,100 metres in less than five minutes. 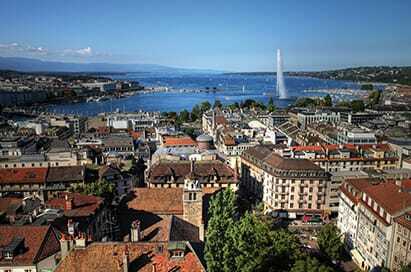 It offers superb views over Geneva, the Alps and the Mont-Blanc massif. 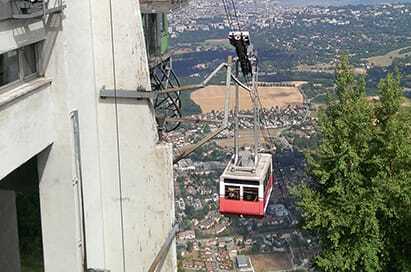 It is located 9km from the Geneva Youth Hostel and is easily reached on public transport. In the traditional Swiss style setting of Hotel Edelweiss, enjoy an evening of cheese or beef fondue, whilst being entertained with yodelling, cowbells and the Alpine Horn. A great atmospheric evening full of local charm.